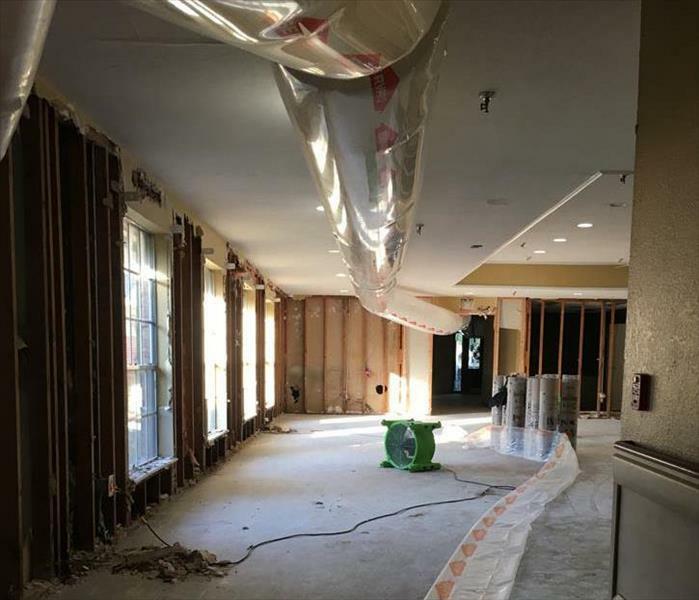 The contaminated water along with the damaged drywall and flooring have been removed from this commercial building in San Jose. SERVPRO techs have set up lay flat conduits to channel out excess moisture to achieve drying goals before reconstruction can begin. 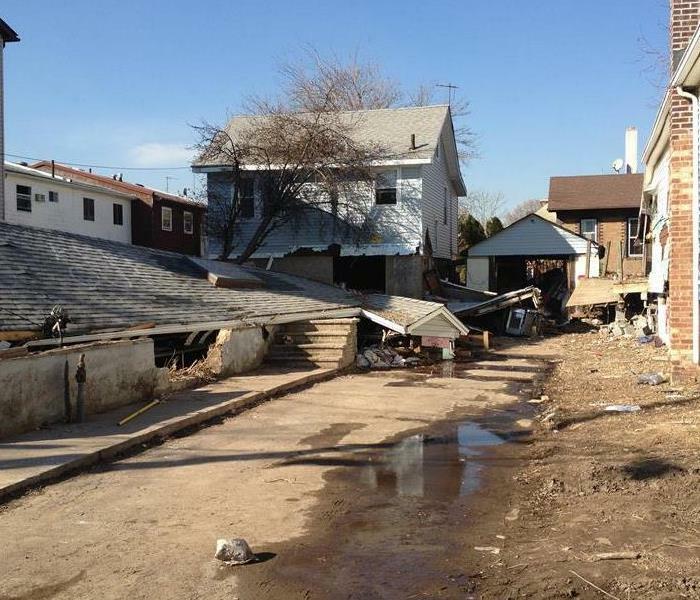 After a storm causes damage to your San Jose home, call the experts at SERVPRO for help! We are IICRC certified in water restoration, mold remediation, carpet and upholstery cleaning, and other cleaning and restoration courses. We have the experience, advanced equipment, and specialized training to restore your home in San Jose to pre-damage condition. SERVPRO of Campbell is Faster to Any Size Disaster! The smoky residue on the tiles of this Fremont tub area can easily be wiped away with SERVPRO's specially formulated detergents and sponges. Even the grout can "Look like it never even happened." The larger challenge is odor removal; you can count on us. Water loss events for businesses can be devastating. SERVPRO used the Injectidry System to dry the area behind the wall in this Palo Alto business. 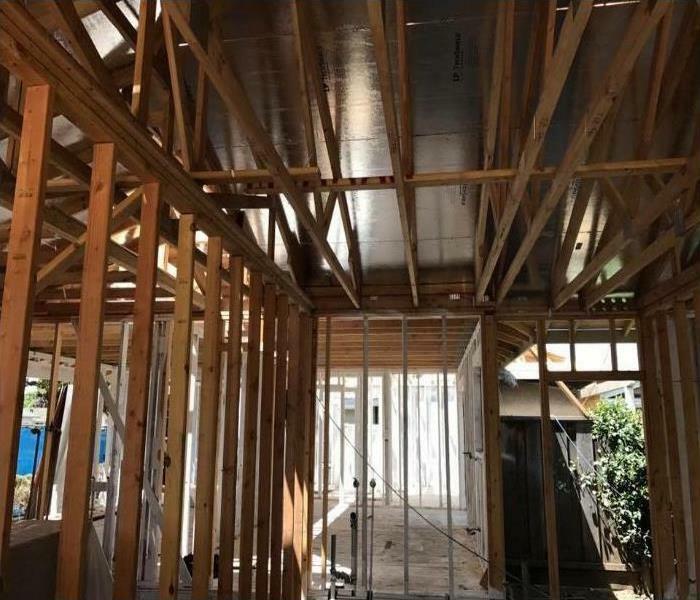 The Injectidry System dries walls that would otherwise require the drywall to be demolished and removed to dry the structure. The Injectidry System is an essential tool that we use because demolition can result in significant downtime for businesses. We work with you to help keep your business open and running during the restoration process. Call SERVPRO of Campbell for all of your water loss restoration needs. 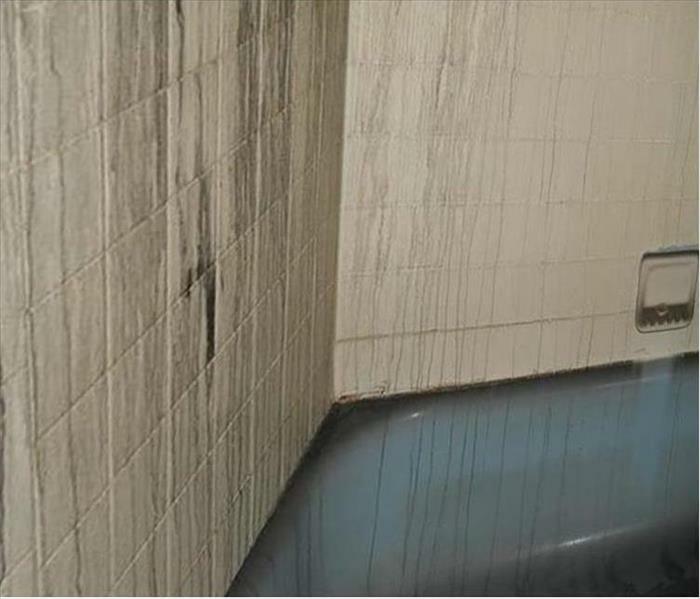 The soot stains in this Saratoga bathroom can be removed without any demolition thanks to the talented group from SERVPRO. By using special dry sponges and vacuums, we can remove most of the film and then wipe down with a special detergent. Hopefully, the repainting will be needed. When the Veteran's Hospital flooded because of a roof leak, they reached out to SERVPRO. 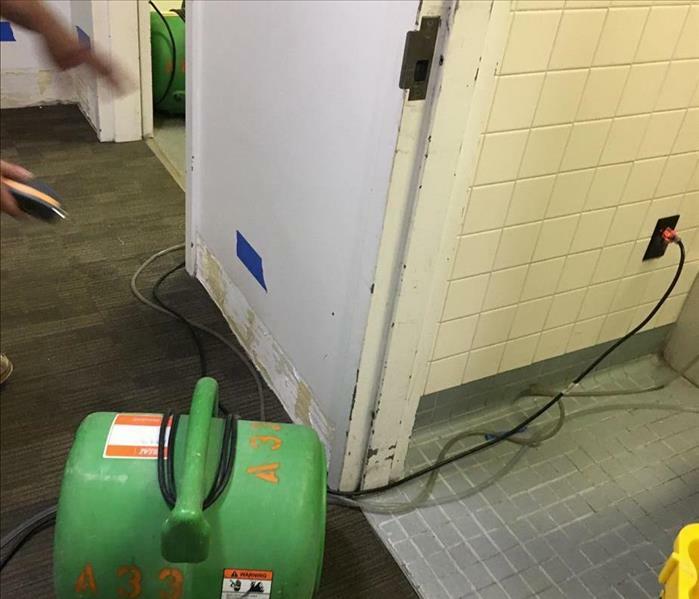 Earlier in the year, we did water damage restoration for the hospital when the sprinkler pipe leaked. They liked our service and called us again when the roof leak occurred. We were honored to restore the damage so that the hospital could serve the heroes who have served our country well. 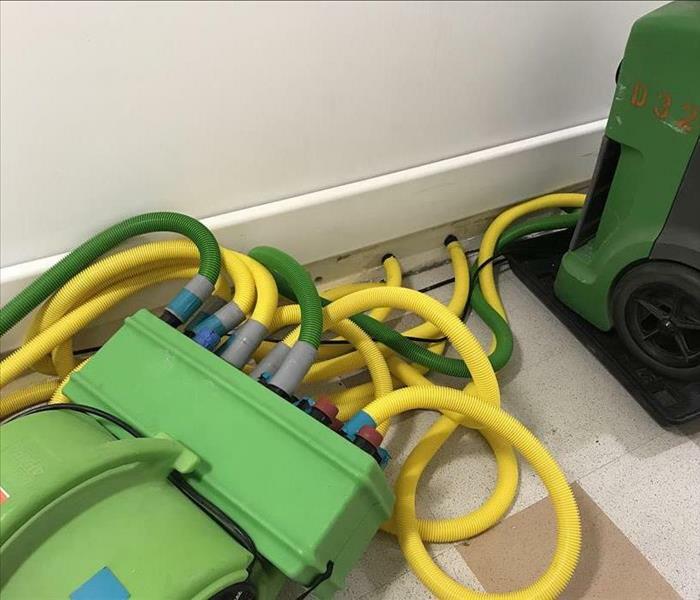 SERVPRO of Campbell is Faster to Any Size Disaster! 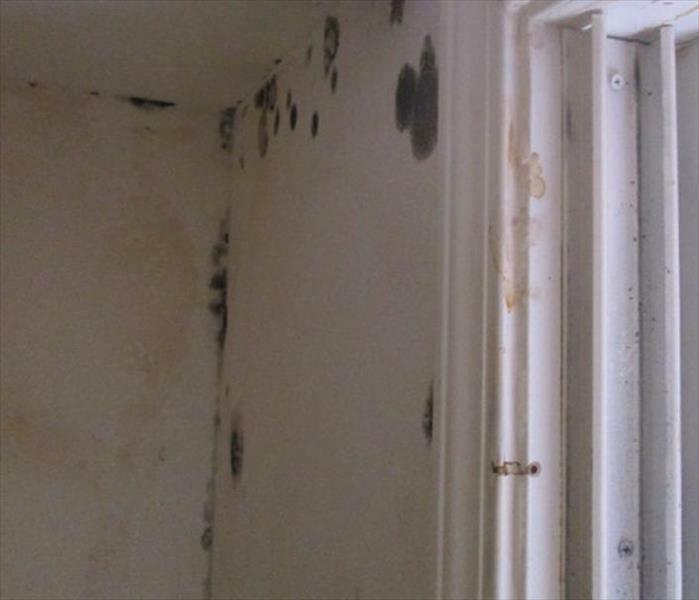 We can handle any size mold infestation that has taken over your home. Our staff is highly skilled, and IICRC certified. We have the training, experience, and equipment to restore your home to pre-damage condition. 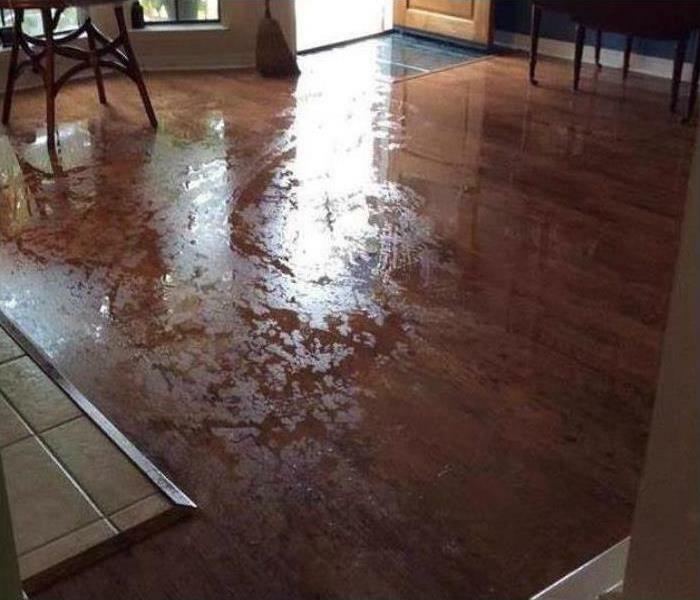 A leaking water filter caused flooding to this floor. Water loss events are a two-part issue because if the structure is not completely dried, the environment is right for mold damage. We completely dried the structure and removed damaged materials. We also applied an antimicrobial to prevent mold growth. 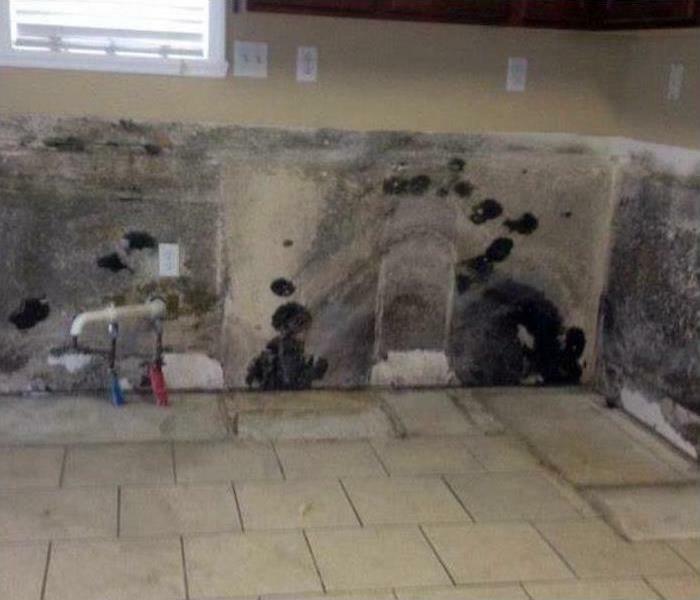 Call SERVPRO for all of your water loss and mold remediation needs. We are available 24/7. SERVPRO has the technical skill backed up with industry-leading equipment like this injecti-dry machine. Water and moisture trapped within a wall cavity in a San Jose home can be heated and suctioned out to the LGR green dehumidifier. By removing the baseboards and drying out the interior surface of the drywall no demolition was required. Our customers greatly appreciate our efforts to limit the mess, inconvenience and perhaps even the cost. Count on SERVPRO for personalized service. 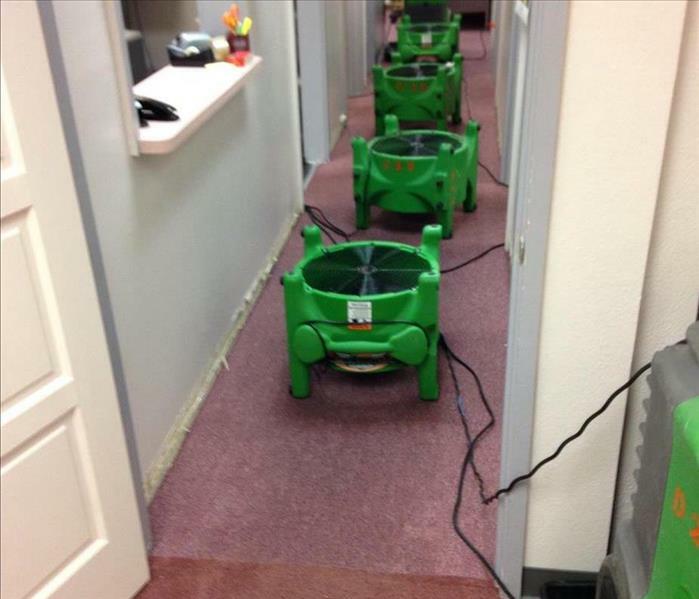 SERVPRO is Well Equipped to be Faster to Any Size Disaster! Did the latest storm damage your home? 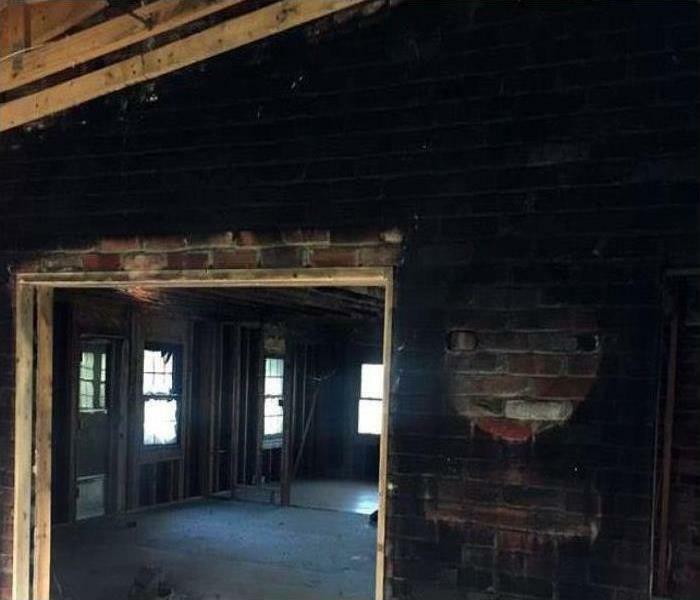 Call SERVPRO! 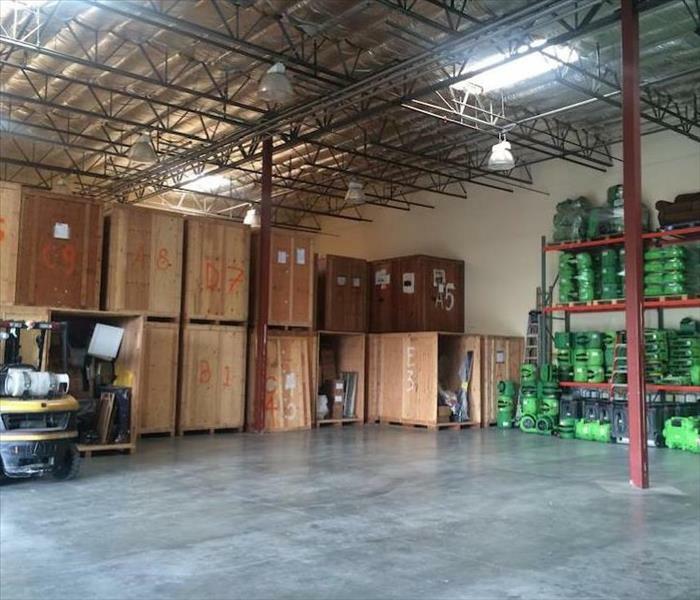 Our warehouse is stocked with the latest state-of-the-art equipment to remove the water and restore your home quickly. We are available 24/7 to make it "Like it never even happened." When our team does a pack-out, the customer's home contents or business inventory are placed securely into a vault for safe storage. The vault is placed in a temperature controlled area where we also store some of our equipment. You can be sure that your home or business contents are secure, if ever you should need such a service. 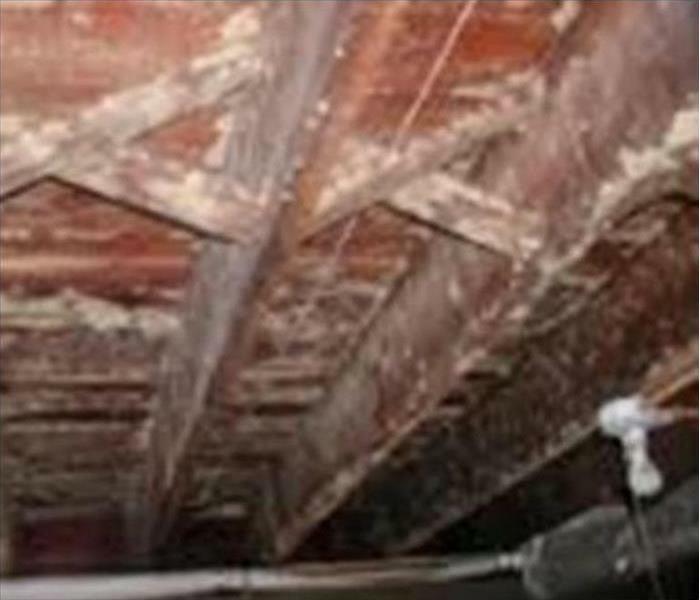 Moisture accumulating in a Campbell crawlspace can often lead to a mold infestation as depicted in this Photo. The food source is there for the taking, plenty of unfinished wood. 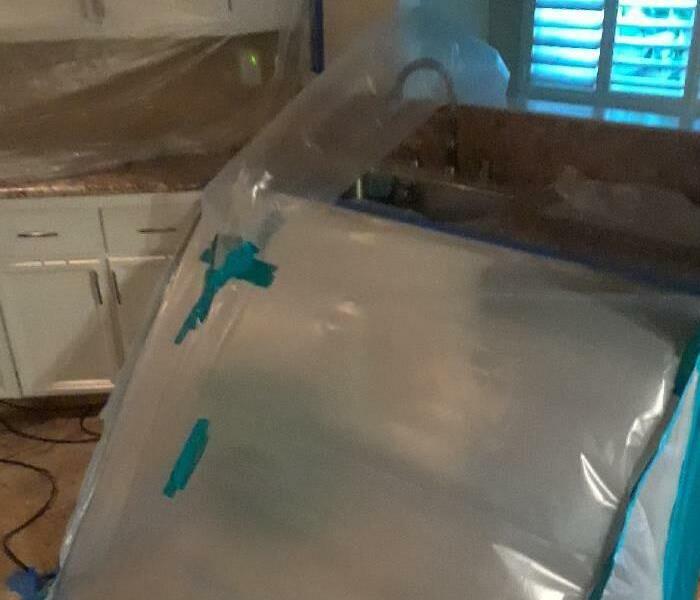 SERVPRO recommends to call us for an evaluation on not only to remediate this mold infestation but also to suggest ways, perhaps an encapsulation, to prevent future damage and problems. This photo says it all-a major storm leaving a path of destruction. When storms or any kind of water or fire emergencies happen, call SERVPRO. Our Green Fleet is always ready to go, and we have the training and equipment to make it "Like it never even happened." The water leak soaked the carpet in the hallway of this San Jose commercial building. We removed the vinyl coving to ensure a total drying of the sheetrock could be accomplished without any demolition. 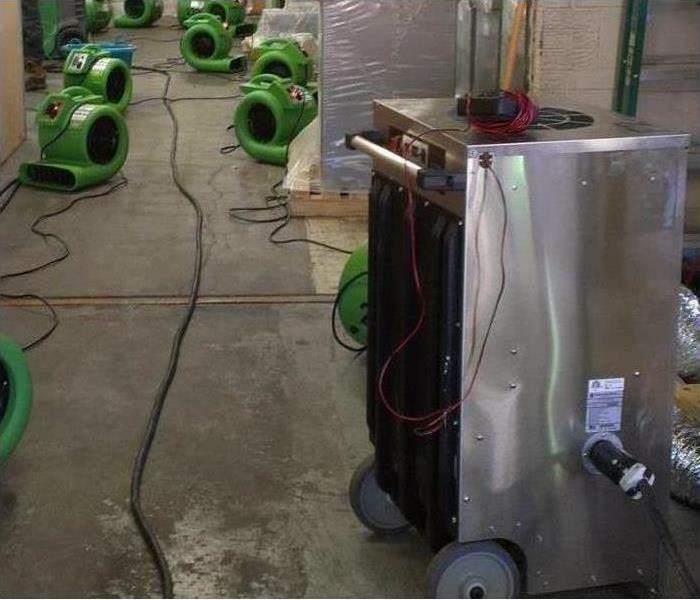 Our air movers are completing the work as our SERVPRO technician is checking for the moisture content of the affected components. We seek to preserve, and not replace whenever possible. We get it done right. 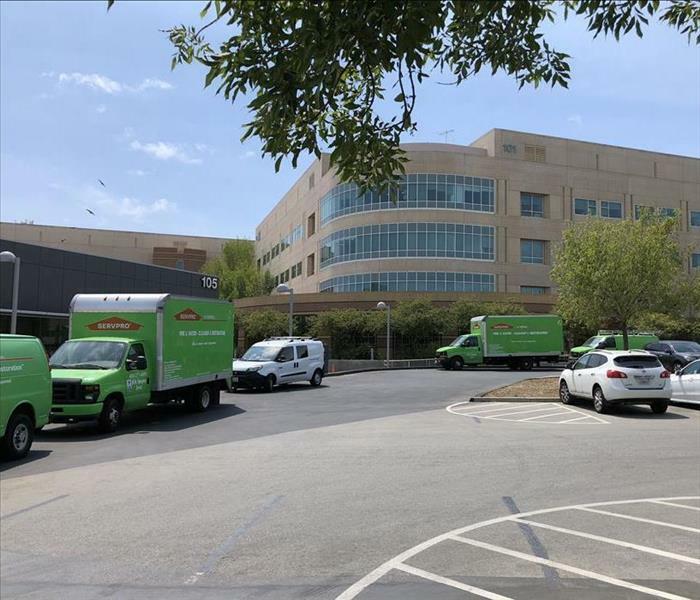 Many large commercial buildings in the Campbell area rely upon the quick response of SERVPRO to ensure that their businesses can get back to business. Our Green Fleet on the scene always makes entrepreneurs and property managers smile, We Faster To Any Size Disaster. Storm damage left a tremendous amount of water to be cleaned up at this Campbell commercial warehouse facility. SERVPRO of Campbell was called in to remove the water and dry the affected areas. Pictured is a portion of the drying equipment that we committed to this project so we could rapidly return the relative humidity to normal which would help preserve the inventory. Water damage at this Campbell home was localized in the kitchen. A malfunctioning dishwasher was the culprit which created the water damage. 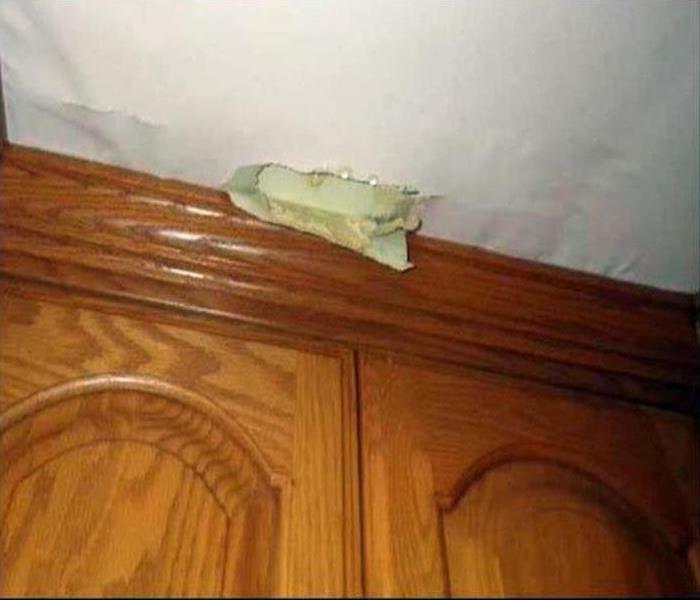 The homeowners were concerned that just waiting for the damage to dry might not be wise. That was a good decision as the longer water sets in building materials, the more secondary damage is usually the result. 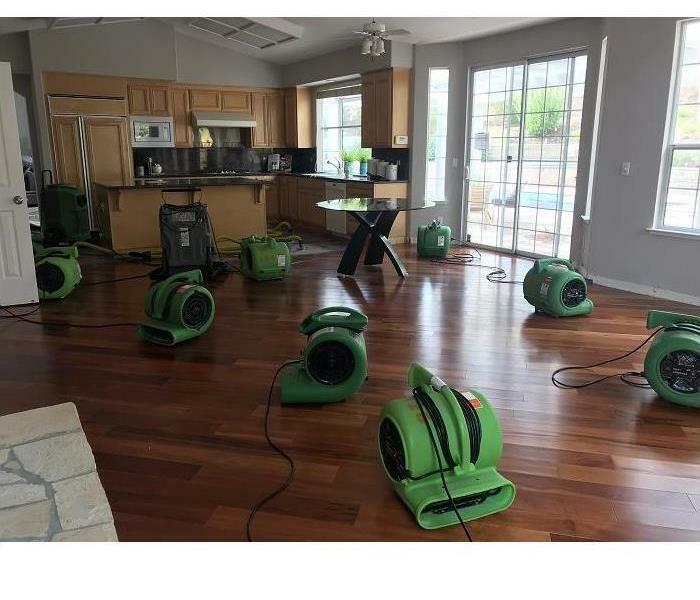 They selected SERVPRO of Campbell to help them out with their water damage. Pictured is a custom containment area we built to help with the drying process. 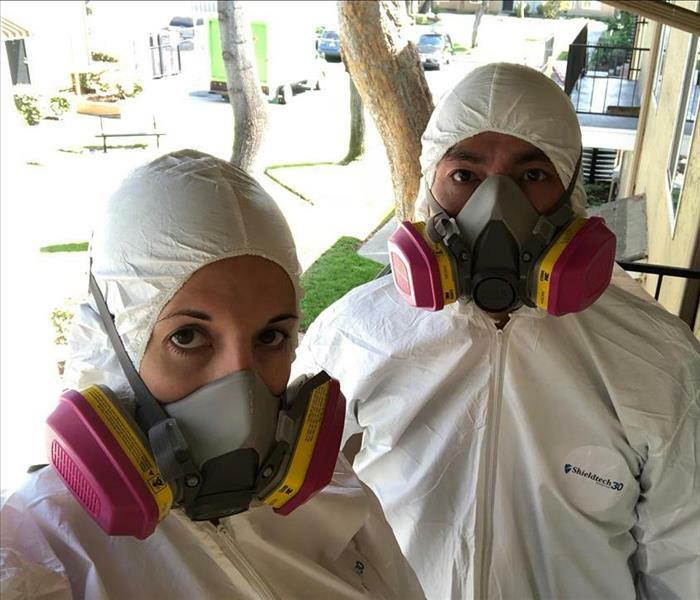 SERVPRO Technicians Wear PPE Personal Protection Equipment During Mold Remediation in San Jose as depicted from a blog. Visit this link for details. We are always ready with the right equipment and products to manage whatever your property problem may be--mold, fire, water, storm, or cleaning. 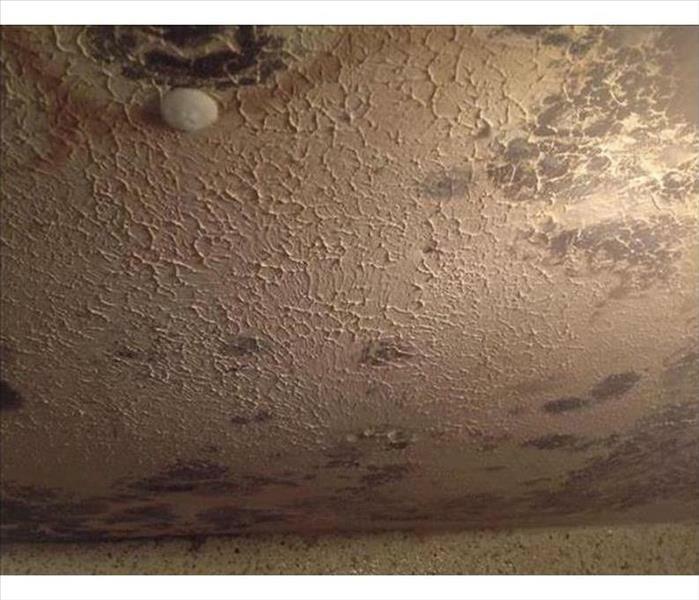 The mold patches on the ceiling of this San Jose home was the result of a slow water leak from the above bathroom. 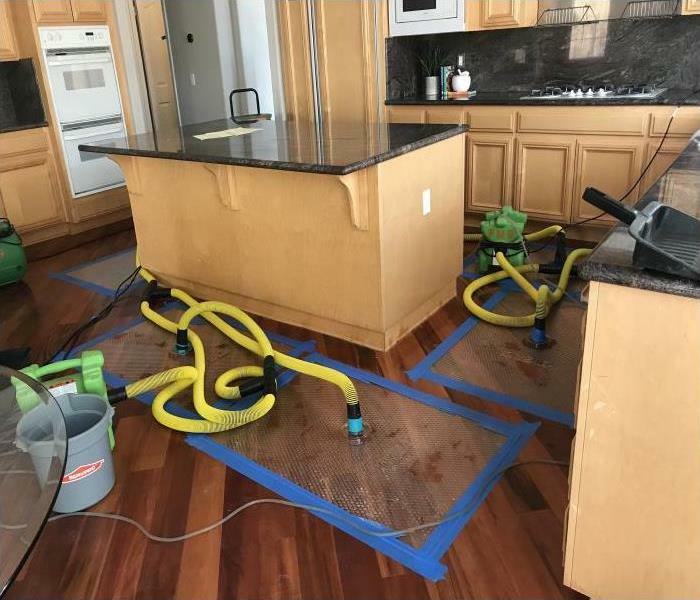 Ignoring a problem only exacerbates the damage and the remediation service as has been witnessed many times by our AMRT applied microbial remediation technicians. The faster we start a project, the less cost and mess results. We are here to help, 24/7. 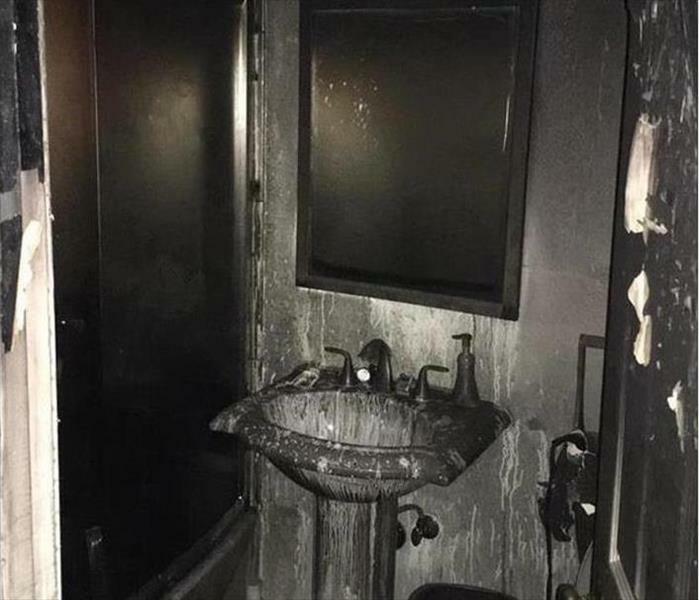 When toilet wax rings fail, water damage can ensue. 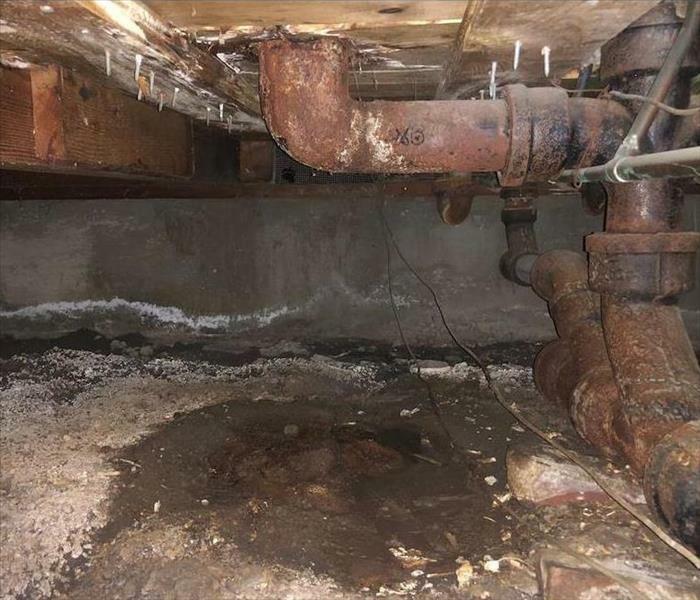 Our client's home recently underwent water damage remediation which included the crawlspace from just such an event. Team SERVPRO of Campbell promptly responded to the call. Water intrusion from stormwater can ruin first-floor levels of homes in San Jose if not quickly extracted. 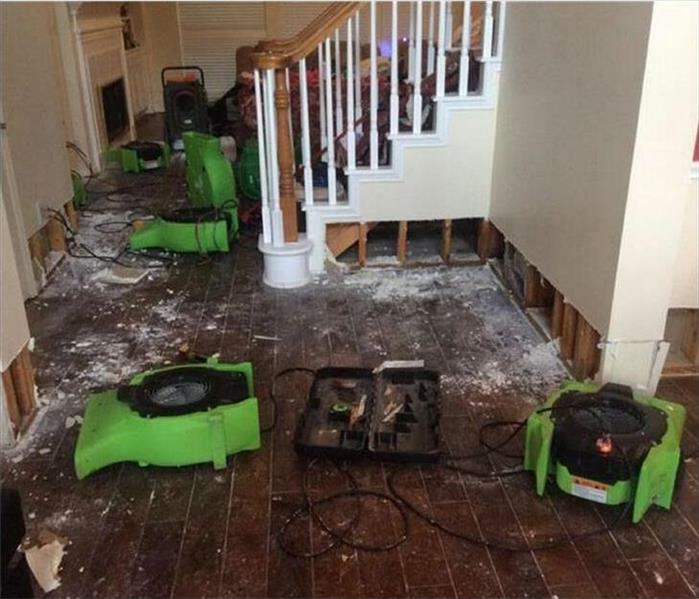 If SERVPRO is contacted promptly to mitigate the damages we can salvage whatever is possible. 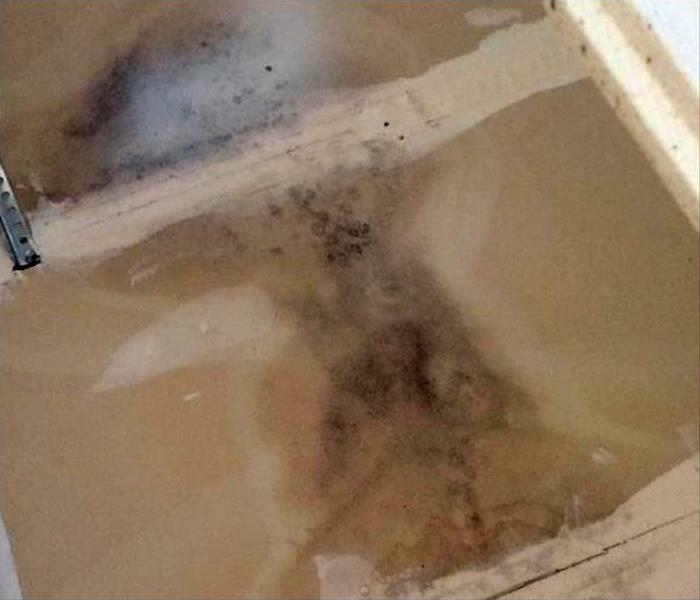 Flood-cuts are needed when contaminated absorbs into the drywall. Our industry-leading equipment can quickly dry out the affected area. Call us for help. 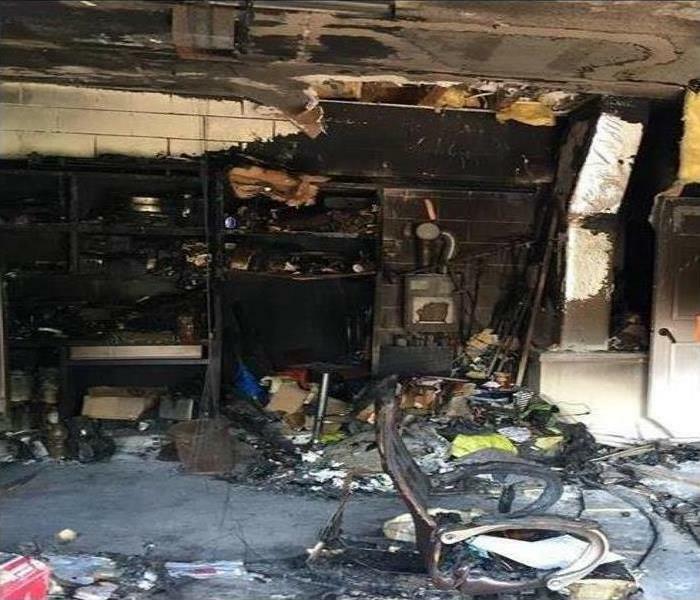 SERVPRO of Campbell is your only option when it comes to fire damage repair and restoration. Our crew of experts is ready to respond 24/7 to your fire damage emergency. 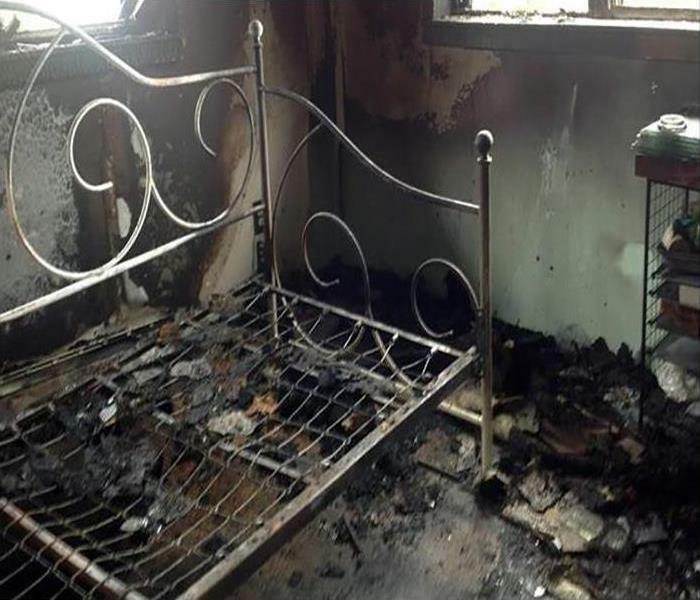 We have the equipment, training, and experience to restore your home to pre-damage condition. 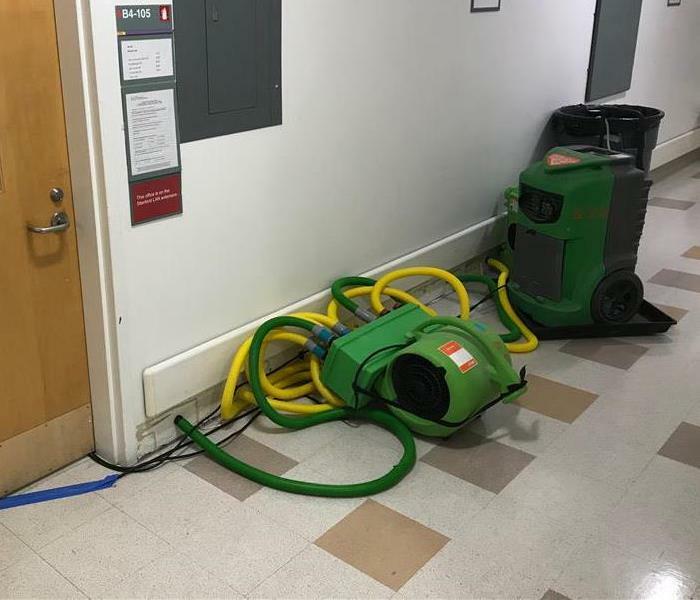 This photo shows some of our equipment (dehumidifiers) drying out the air from a pipe leak that flooded a commercial office space. Carpet and linoleum flooring were affected. 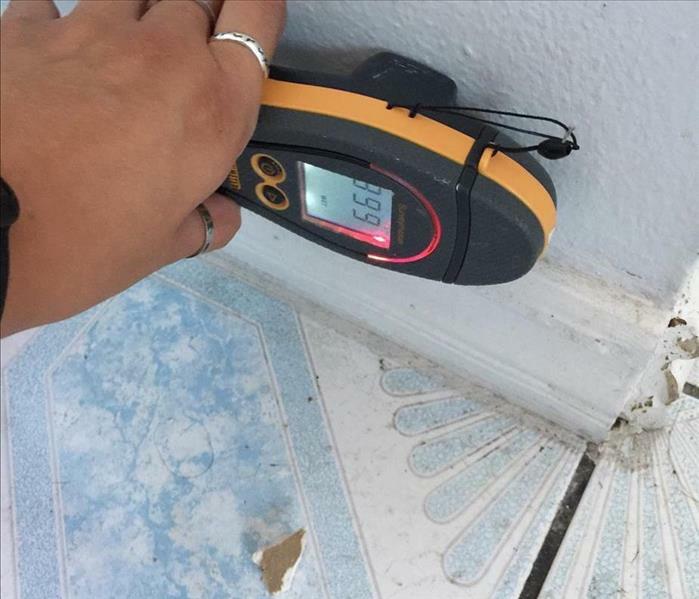 Our team first took moisture readings of the flooring, baseboard, walls etc to determine what needed to be dried out. We used dehumidifiers, air movers to salvage what we could from their carpet. As you can see in the photo, the carpet was very damp, and needed adequate time to dry. 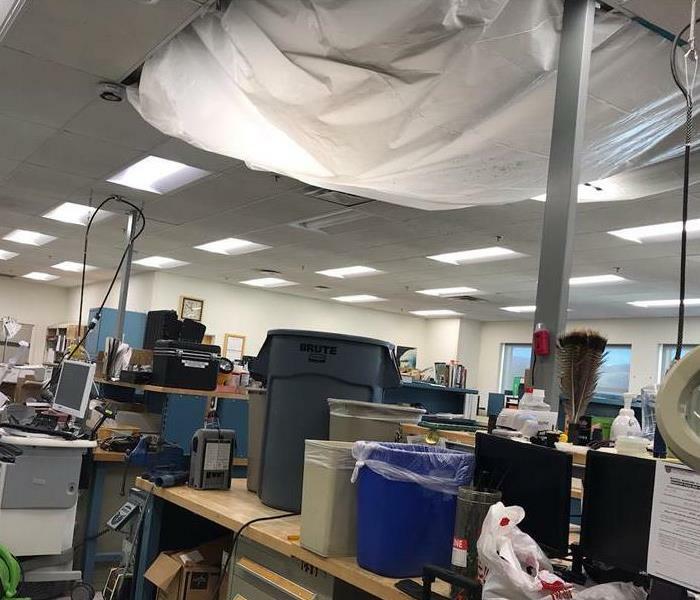 We were able to get the office space dried out promptly to minimize the impact on the day-to-day operations of the business, as we know that for every day a business is shut down, they are losing money. Luis and Blas are mudding the newly installed drywall to the ceiling where there was water damage. They are also giving it a heavy texture to match to the existing and then they will be priming and painting it to make it "Like it never even happened." Meet the SERVPRO of Campbell Team! 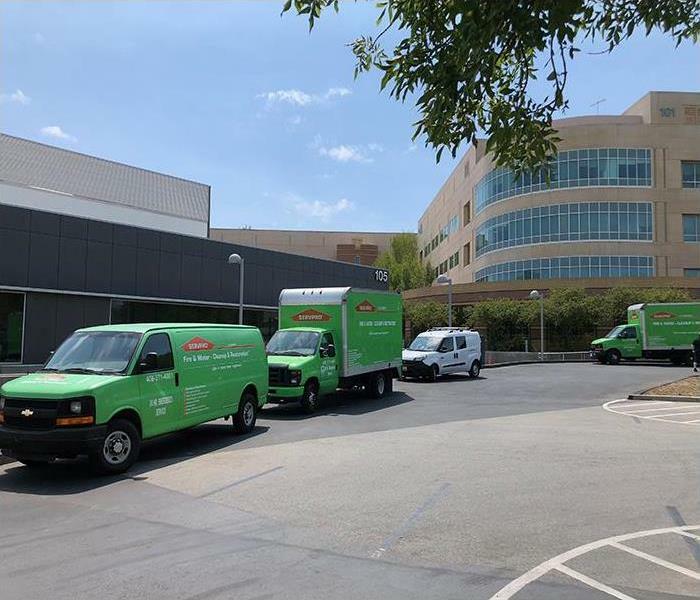 with over 20 employees, SERVPRO of Campbell has the resources and capabilities to handle any size job, large or small. Our employees here at SERVPRO take great pride in our work. We have achieved many awards over the 14 years of business such as the SERVPRO "Success Through Service Award". Here is just a portion of our vehicles that we use to service our customers!!! 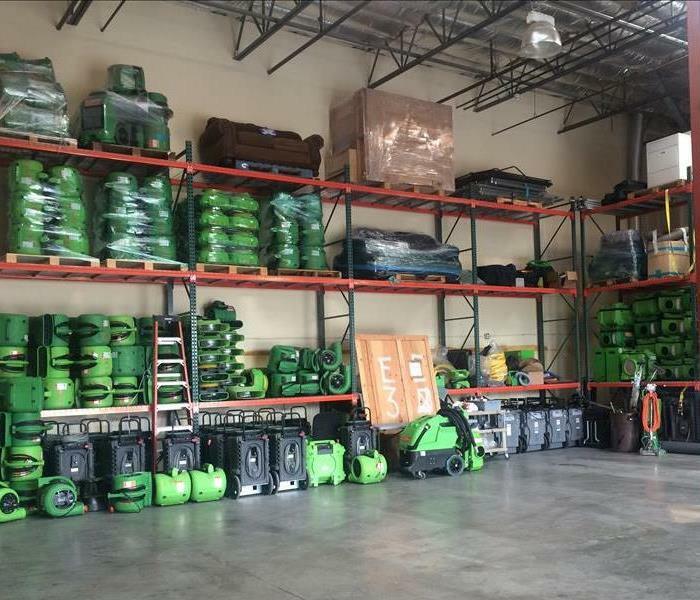 Here is just a portion of our dehumidifiers, air scrubbers and air movers in our warehouse. We make sure to keep equipment clean, well-maintained and organized to make sure that it does the job well every time! One of our Project Managers performing a moisture reading's at a water damage job in Campbell, CA. 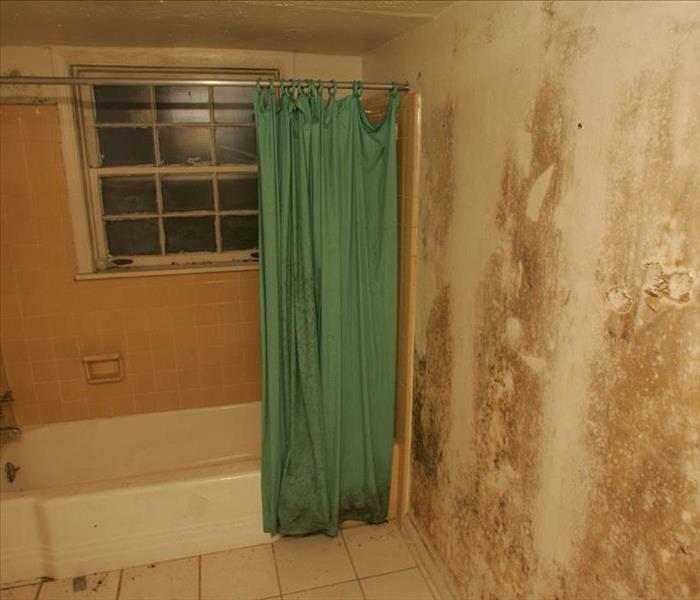 This is a picture of extensive mold in a residential home bathroom. There was no ventilation happening (even though there was a window which would've greatly helped with that). The drywall needed to be removed completely as it was deeply embedded into the wall. Our team of techs handled the demo and our construction side handled the drywall hanging/taping and painting to make this bathroom like new and "Like it never even happened." 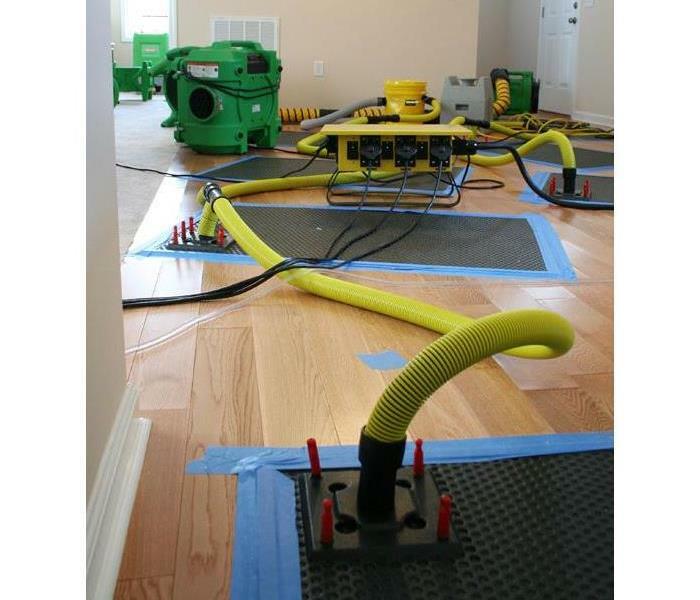 This picture shows the process of drying floors after water damage has occurred. SERVPRO techs and project managers do their best to minimize costs by preserving whatever portions of the wall/floor that have not been affected (as opposed to other contractors that rip up the entire area without salvaging anything to maximize profits) We have highly-trained techs and project managers who are able to decide what areas need to be removed and which areas can stay. This picture is after our Techs ripped up the affected hardwood flooring that was caused by a water heater failure on the 2nd floor of a residential home. The owner was appreciative of our quick response to the scene and was happy that we were able to contain the water from spreading to the rest of the floor.